Pumba Private Game Reserve near Port Elizabeth is well placed at Lake Kariega for a bush and beach getaway in the heart of the historic Eastern Cape, South Africa. 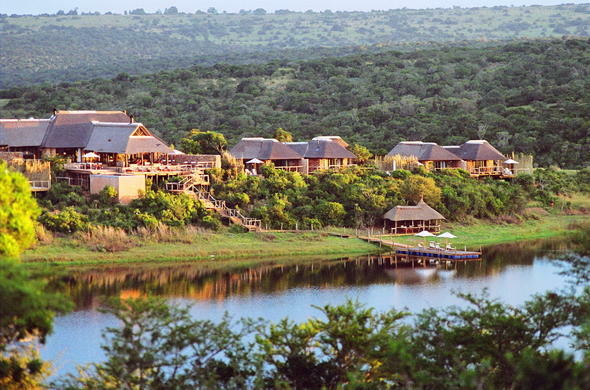 This beautiful Eastern Cape game reserve in South Africa is just an hour’s drive from Port Elizabeth airport. Families, conference delegates and discerning travellers can easily access Pumba Private Game Reserve for exciting malaria-free safaris. The historic, university town of Grahamstown is only 20 km (12 miles) from Pumba and the Gary Player designed golf course at Bushman Sands is just 30 minutes away. Beautiful beaches and seaside charm can be found in the towns of Kenton-on-Sea and Port Alfred which are also in close proximity. Covering over 6 000 hectares of land, Pumba Private Game Reserve is home to Big Five game, Elephant, Rhino, Buffalo, Lion and Leopard, and the very rare White Lion. There are actually around 45 mammal species including Cheetah, Wild Dog, Hyena and the graceful Giraffe. Birding enthusiasts will find plenty to see with nearly 317 species occurring in this region. Pumba Private Game Reserve, Eastern Cape South Africa has its own helipad and airstrip, details on request. The nearest airport is in Port Elizabeth (105km / 65 miles) and the closest town with all amenities is Grahamstown, about 20 minutes drive away. Follow the N2 highway towards Grahamstown for 100km (62 miles). The Day Safari Arrivals is situated on the left hand side. To get to the lodge, travel for another 5km (3 miles) and take the Alicedale turnoff. Drive along the gravel road until you see the Pumba sign telling you to turn right. Continue along the road until you reach the Main Gate of the Reserve on your left. Follow the N2 towards Port Elizabeth for 20 kilometres (12 miles). To reach the lodge, take the Alicedale turnoff. Drive along the gravel road until you see the Pumba sign telling you to turn right. Continue along the road until you reach the Main Gate of the Reserve on your left. The Day Safari Arrivals is situated 5km (3 miles) further on the right hand side. Pumba Game Reserve near Grahamstown and Port Elizabeth, Eastern Cape, South Africa, is set amongst dense bushveld and overlooks Lake Kariega, where game animals come to drink.